Hi Friends. Here we are, in the last full week of May. Memorial Day weekend is almost here. You know what that means? We're about to celebrate our first wedding anniversary! In celebration of our anniversary on May 29, I'm planning a few wedding-related posts. First up: let's talk photos. I love them--who doesn't right? I also love photo albums. In high school, I was a passionate scrapbooker. I spent hours putting together albums using pretty papers, decorative scissors and acid-free glue and stickers. Good times. Now, I turn to iPhoto for all my photo book needs. and most recently, an album of snapshots from the wedding. Working in iPhoto is easy if you're a Mac owner using it as your digital photo storage and editor. 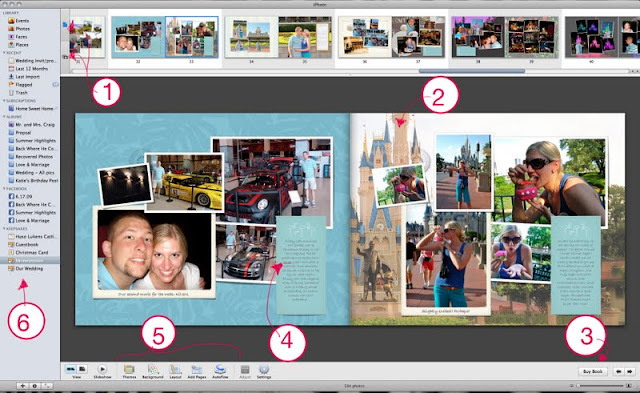 It's as simple as dragging and dropping photos into the blank layouts. Photos and pages are always easily viewable on the top of the screen. Photos already placed in the book will get a check mark next to them, so you'll know if it's already used. Make custom backgrounds by inserting a photo. Our honeymoon album feels very Disney (remember, we went Disneymooning) because I used photos as backgrounds. Once you're done, just click "Buy Book." Ordering is easy, and it usually arrives in less than two weeks. Auto spell check. Ask anyone. It's a H.U.G.E. must in my world. Lots of options. Hardcover, paperback, ring binding and more options in various sizes. Pick a basic look from a handful of stock themes. From there it's easy to add even more customization--fonts, colors, layouts, etc. The project will always be available, should you need more in the future. Anything you make and order through iPhoto will continue to be in the program. Keep in mind that these are for photos you are licensed to reproduced--whether they're your from your own camera or a friend's. Obviously, don't plagiarize. But of course you know that. So yeah, iPhoto books were and are a huge part of our wedding. We'll forever remember all sorts of things because of them. There are tons of awesome online photo making sites out there too but I'm so hooked on iPhoto I've never looked. Which are your favorites? Thank you for the motivation. I need to do Murray's first year book still and I am debating what site to use, but I think I will go with the one that offers me the best bang for the buck. I may ask for your graphic assistance. PS: I CANNOT BELIEVE IT HAS BEEN A YEAR! SEEMS LIKE JUST YESTERDAY YOU BECAME MRS. CRAIG! Gorgeous wedding, Happy 1st Anniversary (tomorrow!) I need to get some of your motivation and get my pics in albums. WE're coming up on 6 years - HA!